FATCA Repeal Update: The action to take right now! There is a SERIOUS bi-partisan push for an updated FATCA hearing to address the sharing of personal financial data and the lock-out of Americans overseas from foreign financial institutions (i.e. their local banks). As a result of Suzanne Iclef Herman’s hard work and tenacity in establishing and cultivating a relationship with her Congressman and his staff, we have succeeded in building bi-partisan momentum in an updated FATCA hearing. Suzanne requested to Congressman Posey’s office that I get involved in order to have as many Americans overseas as possible contact their respective Congressmen/Congresswomen. 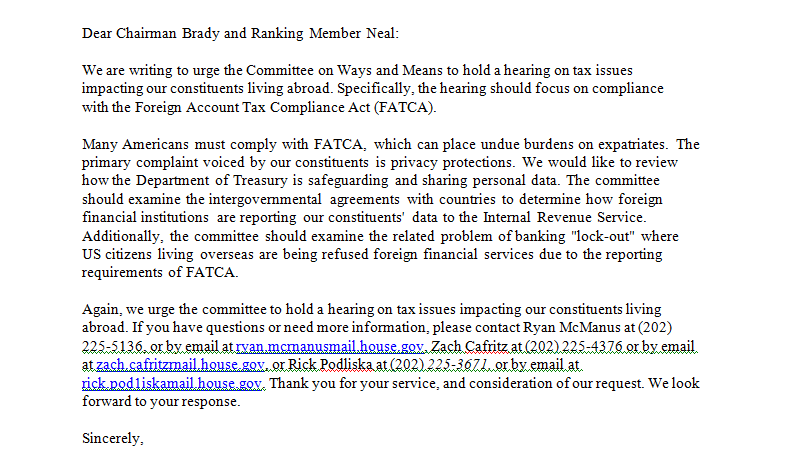 The attached letter has been sent to Members of Congress (MOC) in a bi-partisan effort to have the House Ways & Means Committee hold another FATCA hearing. In conjunction with the request, MOCs have been sent a letter (in the same aforementioned attachment) which each MOC can send to House Ways & Means Committee showing their support for another hearing. Americans overseas are asked to write their Congressmen/Congresswomen to sign the letter. Therefore, I am requesting that you contact your Congressman/Congresswoman via e-mail and/or fax AND FOLLOW-UP WITH A TELEPHONE CALL. I have attached the THREE STEPS to be taken in order to contact your representative via e-mail as well as the link to find your representative’s fax number. Please follow the instructions. FOI CHALLENGE – Calling all MODEL 1 IGA COUNTRIES! Over at FixTheTaxTreaty! we wanted to know how much FATCA data was being sent from Australia to the IRS, so we submitted a Freedom of Information request to the Australian Tax Office. We found that the numbers were much higher than we had expected. As much as 6%(!) of the non-retirement financial assets of Australian households and businesses was reported to the IRS for 2016, along with A$ billions in interest and dividend income. FATCA requires Australian financial institutions (very broadly defined) to report account holder details as well as account balance, dividends, interest and other income paid, and gross proceeds from sale or redemption to the ATO for transmittal to the IRS. It is evident from the graphs below that the amount of data going to the IRS has exploded since the initial data transfer of 2014 data (transferred 30 Sept 2015). Once we had the data, we wrote a blog post and sent out a media release . The story has been picked up by the Sydney Morning Herald .Increased visibility of the sheer volume of data and exposure of local assets to US taxation can only help gain sympathy and support in the countries where we live. With this visibility, we can start to move the conversation to the costs and benefits of FATCA, and a discussion of how to protect the sovereignty of our home countries. Clearly the IRS must be drowning in data. We would like to get a better idea of the global scale of this data dump. So, we’re challenging the rest of the world to try the same thing. If you live in a country with a Model 1 IGA (where the data goes to your country’s tax authority for transmission to the IRS), submit your local equivalent of a FOI request. Let us know in the comments at Fix The Tax Treaty when you submit your request and when you receive a response. If the response is not easy to analyse, we can help, just email us admin at fixthetaxtreaty dot org.